Boll weevils, or cotton boll weevils, were a significant problem to North Carolina cotton growers during much of the twentieth century. The boll weevil (Anthonomus grandis) came to the attention of the U.S. Department of Agriculture in October 1894, when a resident of Corpus Christi, Tex., mailed a specimen to the department. The insects, which feasted on the boll, or pod, of the cotton plant, were spreading north and east into Texas's prime cotton-growing areas. By the 1910s they had expanded their territory as far east as North Carolina. The first year of severe boll weevil destruction in North Carolina was 1922, when the pest claimed 13 percent of the state's cotton crop. In 1929, 21 percent of the crop was lost; the damage was substantial but considerably less than in other states' worst years. The problem persisted throughout the middle decades of the twentieth century. North Carolina's northeastern counties participated in an experimental boll weevil eradication project covering 15,000 acres beginning in 1978. At the time, North Carolina's cotton acreage had sunk to 42,000 acres, its lowest level in years. 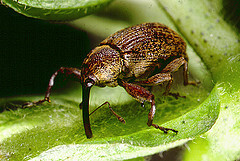 The project's combination of chemical, biological, and cultural methods of eradicating the boll weevil proved successful, and subsequently a federal, state, and university program in North Carolina and South Carolina was launched to destroy the pests. These efforts were also successful, and North Carolina was declared free of boll weevils by 1985. Douglas Helms, "Just Lookin' for a Home: The Cotton Boll Weevil and the South" (Ph.D. diss., Florida State University, 1977). Helms, "Revision and Reversion: Changing Cultural Control Practices for the Cotton Boll Weevil," Agricultural History 54 (1980). Cotton Boll Weevil. Image courtesy of Flickr user Jimmy Smith. Available from http://www.flickr.com/photos/jimmysmith/134371832/ (accessed August 27, 2012). It's really interesting how invasive species such as the boll weevil always seem to evolve and manage to build new, more powerful defences against our constant efforts to control their population. Luckily, we don't have the weevil here in the UK (for now) but this does not prevent local academics and industry experts from participating in research projects and developing a sustainable solution to the problem. As a pest expert, I follow the topic closely and am waiting to see what they will come up with in the end.